SJ Orgs: Waste to Charity – SouthJersey.com. Waste to Charity is a non-profit organization encouraging donations of personal items from businesses and individuals in return for a tax-deductible donation and the peace of mind to help those less fortunate. When selling a personal item, people normally incur several expenses such as advertising, repairs and storage. By donating to Waste to Charity, you will (in most cases) be allowed to deduct the Fair Market Value of that property from your taxes. Any accountant or tax attorney can make these deductions, or you can receive help in handling property contributions through IRS publications available by e-mail, fax or mail from Waste to Charity. In most cases, the organization will arrange for shipment of donations. By providing an In-Kind gift, you have the chance to make the difference in the world. Waste to Charity is looking for all kinds of donations including foods (overstock, close to date, misprints), supplies (industrial raw materials, ingredients, packaging materials), machinery, equipment (warehousing, storage, commercial and industrial equipment, computers, printing equipment), personal/consumer items, transportation (cars, trucks, vans, buses, boats, aircraft) and real estate. The Health begins with Hygiene program seeks to combat disease by providing cleansing products to the poor. Items donated are personal hygiene products (soap, shampoo, lotion, deodorant, toothpaste, etc. ), diapers, detergents, and cleaning products. The Clothing is a Human Right program provides clothing to people in poverty across the nation and around the world. Items donated are shirts, hats, gloves, pants, undergarments, jackets, boots, shoes, and socks. The Fabric which Binds us All program provides underprivileged women with resources on how to learn to sew. These women can use these skills to start their own business or simply knit clothes and blankets for their family. Items donated include fabric, lace, buttons, zippers and sewing machines. The Food is a Human Right program provides food and fresh water to people suffering from natural disasters, poverty and war. All dry food items and water/fruit juice are needed. The Medicine Needed to Save Lives Now program provides basic medicine and first aid equipment to impoverished people. Supplies needed are band-aids, ointment, aspirin, cold medicine, crutches, braces, vitamins and other over the counter medicines. The Write Now: Immediate Educational Needs program provides school supplies to poor children around the world. Supplies include pencils, pens, erasers, books, paper, backpacks and school uniforms. 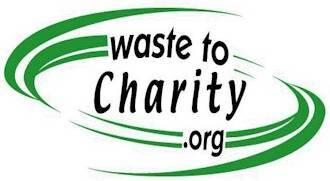 To contact Waste to Charity, call (856) 456-4996, write to info@wastetocharity.org or visit their website for a donation form. For more on local Organizations, visit our South Jersey Organizations page.